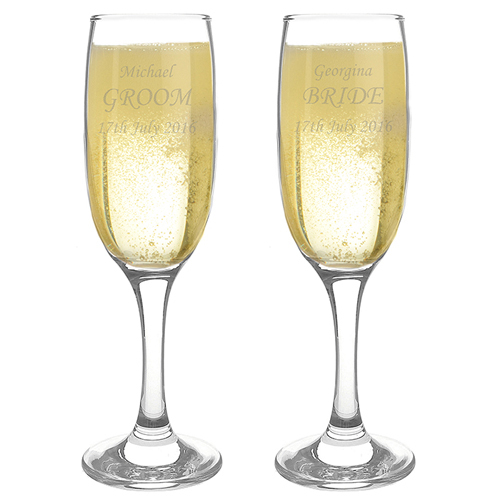 Personalise these Celebration Flutes with any 5 line message and create a bespoke present for any occasion. These beautiful flutes are laser engraved with the key part of the message in large lettering, 5 lines per flute (14 characters for line 1,4, and 5 and 12 characters for lines 2 and 3 which are in bold text). The flutes also come beautifully presented in a silk lined box. Each flute measures - 23cm x 7cm x 7cm. Personalise 5 lines per flute (14 characters for line 1,4, and 5 and 12 characters for lines 2 and 3 which are in bold text).